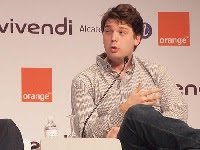 Last Thursday the 31-year-old founder of Groupon Andrew Mason was fired as CEO of the company. The board took this decision in a moment when things aren't going well for the deal-of-the-day website. Changes in the leadership of the company have been a rumor since last November, when Mason addressed this issue at a Business Insider conference saying, "Our stock is down about 80%, it would be weird if the board wasn't discussing whether I'm the right guy to do the job, it's their chief responsibility to ask that question." Many analysts agree that the underlying problem causing the fall of the company is that people got tired of the kind of service it provides.